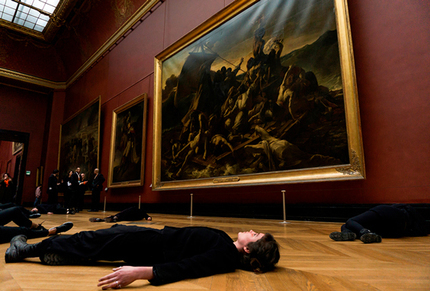 The activists, who were dressed in all black, pretended to collapse on the ground in front of the artwork while some members of the group decried the harmful effects of fossil fuels on the environment. They remained in place, interrupting visitor traffic in the museum, for two hours. The action prompted the Louvre’s staffers to evacuate the Salle Mollien room, which is in the Denon Wing on the first floor of the institution. The gallery also features other French Romantic works, including Eugène Delacroix’s Liberty Leading the People, 1830. Organized by the Paris-based collective Libérons Le Louvre (Free the Louvre), which is led by the American NGO 350.org, the action is the latest in a series of protests the group has performed at the museum. Last year, its members created a symbolic oil spill in front of the famed Hellenistic sculpture the Winged Victory of Samothrace. The collective also launched an online petition calling for the Louvre to sever ties with the fossil fuel industry.